Let me preface this post by saying the only reason I am able to post on a Friday is because I am on a fur-cation. (3 back-to-back furlough days = a fur-cation) The only hiccup in this fur-cation was trying to explain to people that it had nothing to do with the hot mess in Washington right now. Way to overlap, Congress. Now get back in there and play nice! I know this picture probably looks silly, but I did take it on an amazing day for our school. We were recently named a National Blue Ribbon School for 2013! I was in the middle of Writer's Workshop when my principal came over the intercom and asked everyone to turn their projector systems to Channel 5 for an important announcement. Then my principal and AP appeared on the screen and asked us to watch an important message. When I saw Arne Duncan's face pop up, I knew we were going to get incredible news! After the message played, our admins popped back up wearing blue wigs! We have been celebrating ever since! :) This is a big accomplishment for our sweet school. Around 70% of our students receive ESOL services, 98% qualify for free & reduced lunch, and 90%+ have met or exceeded standards on state testing for the last 2 years! I am still in love with Morning Meeting! One of the things we've added recently is a Celebrations and Changes chart. My Morning Meeting Director (a highly coveted class job!) asks the students to close their eyes and think of something we are doing well as a class and something we need to change. She/He reminds them to try and tie it into the 7 Habits. When she prompts them to open their eyes, they can share their thoughts and I jot them down on the chart. If something is repeated during the week, I give it a check mark. The kids LOVE seeing things move from the "change" side to the "celebrations" side! 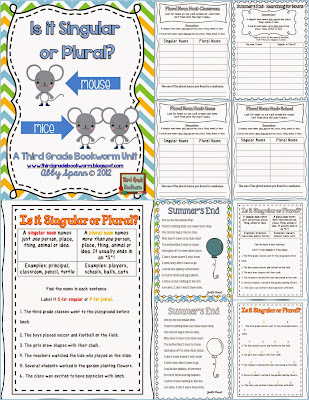 We wrapped up our unit on plural nouns... finally! I swear it took a couple of weeks (maybe 3!) to finally get all of those spelling rules down! The positive in all of that is that I was able to fine tune my singular and plural nouns unit. There are lots of new activities, and printer-friendly black and white versions of just about everything! My kiddos really like having a copy of the anchor charts we fill out together in our mini-lessons. It makes a great resource when they are doing homework and need a reminder! We've also been working on opinion writing pieces, and I have a unit that is about halfway done. :) I'm hoping to have it ready soon! My kids are loving it and their writing is growing by leaps and bounds! The challenging part has been making something that addresses all of my writer levels, so I hope it's something you'll be able to use as well! The charts above are from mini-lessons on thesis statements and writing about the reasons behind our opinions. The kids had to write about whether or not our school should get a pool. Totally an imaginary idea, but they had a blast! Last but not least, I'll just share my view for the night with you. This little man has been all up in my business. :) Herbie, meet the blog-iverse. Blog-iverse, meet Herbie. 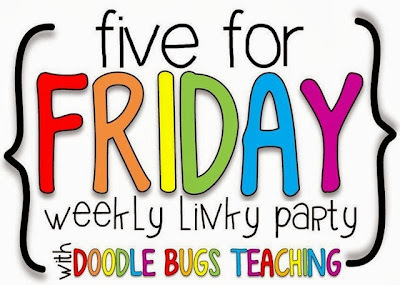 Go link up at Doodle Bugs! I'm off to see what everyone else has been up to this week! Plus Herbie looks exactly like our cat Sadie. What an accomplishment! Congratulations to you and your school! 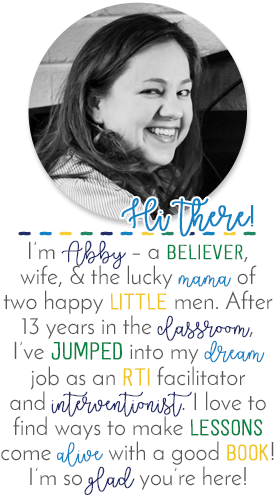 So, is there anything specific you feel like you and other teachers are doing that is making that HUGE difference? Any resources or insights you can share?